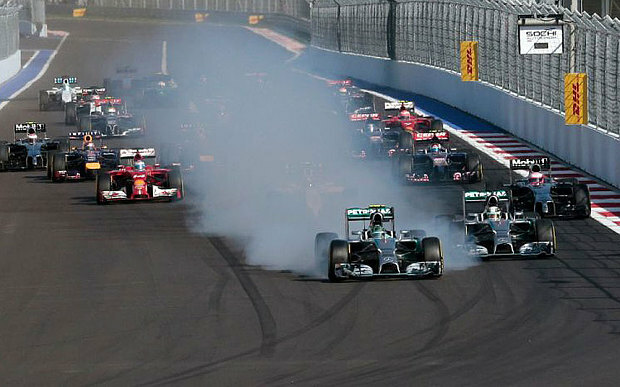 So, a week on from the difficult Japanese Grand Prix, Formula 1 descends upon Russia, for the first ever F1 race. Thoughts were firmly on Jules Bianchi, who remains critically ill in hospital in Japan, and out of respect for him, Marussia raced only one car. The drivers and the rest of the paddock assembled before the race in another mark of respect, and we all wish him well. The race itself might have been a milestone (the first championship race in Russia), but aside from some early excitement, it wasn’t especially memorable. Rosberg managed to slip past Lewis Hamilton at the first true corner of the track, only to lock up his tyres and slide off the track, not only being forced to give the place back to Hamilton but also being forced to pit, as he had caused serious harm to his tyres. Pitting on lap two meant Rosberg ended up last but one (Williams’ Massa also pitted on lap two), and thus he had to work hard to get back into a decent points-scoring position. He also had to make his new tyres last for 52 laps, no easy feat in modern formula 1! Hamilton himself had little to do except keep his concentration up and make sure he didn’t do anything stupid. He could afford to cruise in the latter stages of the race, and thus did exactly that as he took his ninth win of the season (and equaled Nigel Mansell’s British record of 31 wins in the process). Rosberg raced well to get himself back into second, minimising the loss of points to Hamilton and showing good tyre management to make sure he didn’t suffer late on. Not a classic race, but it means Hamilton is now 17 points clear (his biggest lead so far in the championship) with three races to go.